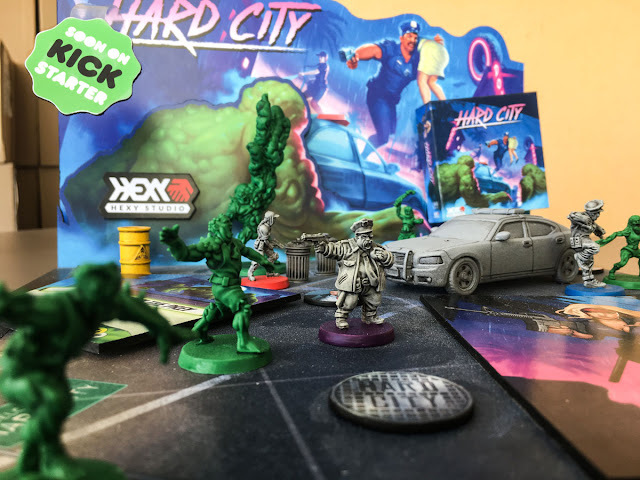 Hexy Models launched their eagerly-awaited Hard City Miniature Board Game Kickstarter today and already made a great start with more than one third of the initial funding goal reached! The Hard City Police Department needs you! Here's why you should join the force - or become an evil genius - right now! By pledging... You're helping us bring an awesome game to life, and make Hard City better for everyone! You're getting a nostalgic ride with a robust, modern game engine under its neon-drenched hood! You're receiving everything in one package - others will have to hunt down Kickstarter bonuses separately! You're joining the ranks of people passionate about what made the 80's unforgettable, and a part of our culture forever! Protect the innocent civilians of Hard City while the nefarious Doctor Zero and his Mutant henchmen cause havoc across the city. 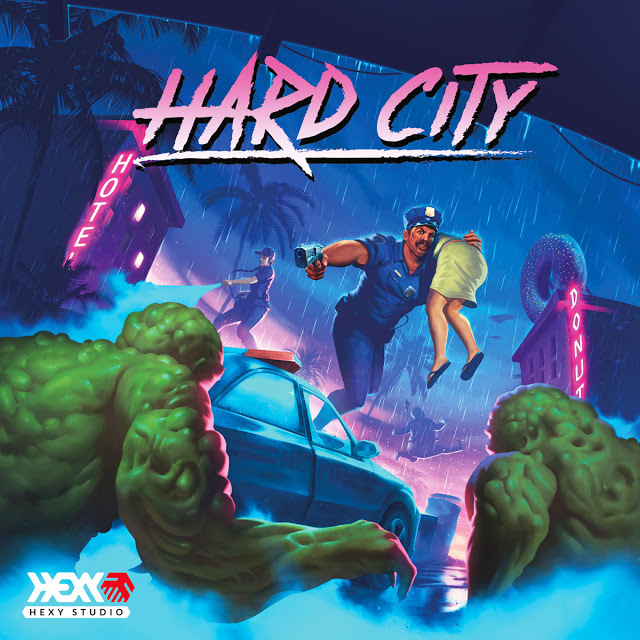 Play as the outnumbered but brave Hard City Police Department to halt the Mutant menace and defeat Doctor Zero in Hexy Models latest board game now funding on Kickstarter here! 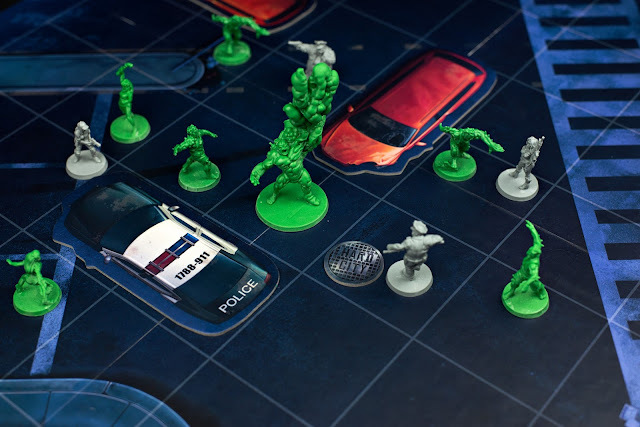 Hard City is an asymmetrical miniature board game of tactical conflict on the mean streets of a mutant-infested town. As Police Officers players spend Action Points (yes, AP markers are shaped as donuts!) to move, shoot, tackle hideous mutants in close combat, and to evacuate hapless civilians. Each turn only one Officer is activated. Then the devious Doctor Zero gets to act, playing cards to command his mutated horde. Cards from his Chaos deck can always be used in one of two ways: either to apply their text or to use their Basic Actions printed on the bottom of the card. This allows the not so good Doctor to spawn and move his mutated minions, attack civilians, and Officers, and to perform special actions like Garbage Throw, Sinister Laughter or Evil Masterplan. Too far out to appear on the board himself, Doctor Zero has a card or a mutant for any job! The streets of Hard City are dangerous, but the HCPD Officers are a bunch of tough guys and gals. In fact, they are way too tough to die! If an Officer's Hit Points are reduced to 0, he or she is just knocked down until the next round, but also gets an It's Not Over Yet! card, which means things will be more difficult for this character in the future. Each knockdown also brings Doctor Zero one step closer to victory, but our heroes have some tricks of their own up their sleeves! Each time a total of 10 Mutants are eliminated, the Officers not only score on the Victory Track but also level up and gain an awesome Skill Card. Oh, did we mention that the game is divided into episodes, which all have a different setup, special rules and winning conditions? They collectively tell the full story of radical action and adventure in Hard City! Filled with Easter eggs and cinematic references, Hard City will keep you on the edge of your seat until the last episode! And even if our heroes beat Doctor Zero, he may still return for a sequel! Speaking of cinematic awesomeness, you will find it not only in the art and style of the game but also deep within the mechanisms of Hard City! To make your experience even more cinematic, we created a unique cutscene mechanism that the Officers may use while fighting mutants! Each Hard City episode comes with a selection of cutscenes, visualized on a separate track and representing crucial moments in the plot. The events in each cutscene are triggered once per game after the Officers have met the scene's requirements. You may choose any scene that is further on the track than the current one, but remember to choose wisely. Once you go ahead, you can't go back! The Hard City Heroes and Villains Miniatures! The Hard City Board Game contains plenty of cool miniatures, skill cards, equipment tokens, chaos cards, folded game board, 4 exciting episodes and more than 60 other illustrated tokens representing donuts, civilians and scenery! 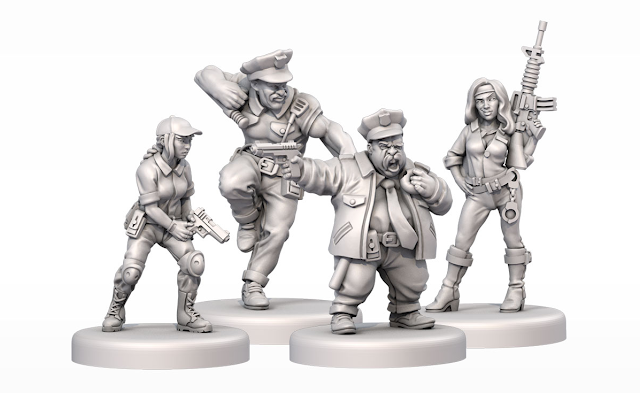 The Hard City Board Game contains 24 plastic 32mm scaled miniatures featuring 4 unique heroes of the Hard City Police Department starring Captain Nails Miranda Casey, Sergeant Donathan Johnson, Furious Nurse Jenny Takabura and last but not least the tough-looking Marcellus Hammer facing no less than 20 of Doctor Zero's Evil Mutant Henchmen in four different sculptures! When I first saw the preview pictures of the Hard City Board Game, I was truly impressed by the quality of the artwork and the digital sculpting of the miniatures. Which is simply superb with these cool miniatures oozing with character and sculpted in great-looking dynamic poses worthy of any 80's B class action movie cast - beat the living heck out of those Mutants with Marcellus Hammer! 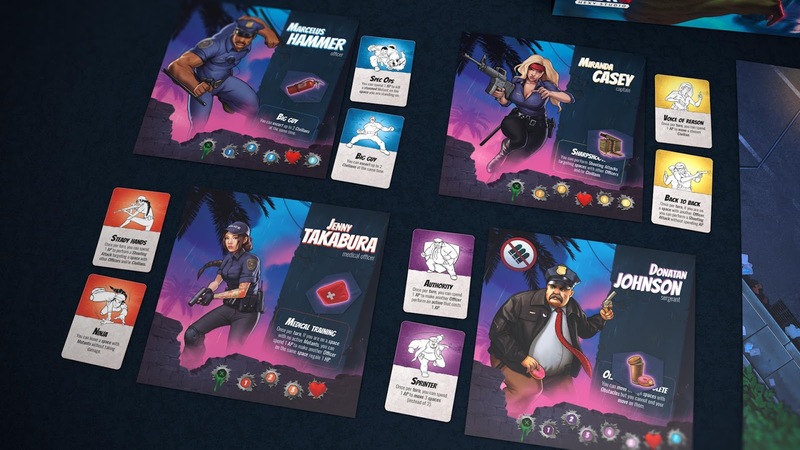 Check the Hard City Board Game Kickstarter here for more information and make sure to pledge today if you want the free 'Blast' Hard City Police Department Dog Companion! Let's together unlock some cool stretch goals and make Hard City The Board Game a great miniature tabletop industry success!